Utilize our SiC Tech Hub for the latest products and news regarding the adoption of this technology in power electronics circuits. At anytime, please contact us for design assistance. The Power Electronics Conference is an excellent opportunity to meet experts and share expertise in bringing down barriers and overcoming reluctance to use Wide Bandgap semiconductors. This year, the Power Electronics Conference will take place on December 4, 2018 at the Hilton Hotel at Munich Airport/Germany. Read more. Researchers at North Carolina State University have built an electric vehicle fast charger that is at least 10-times smaller than existing systems and wastes 60 percent less power during the charging process, without sacrificing the charging time. The team is now building a version that is capable of charging vehicles more quickly, while also charging multiple vehicles at the same time. The new technology is called a medium voltage fast charger (MVFC). Read more. The very fabric of economic life today is inextricably linked to data. But if you look closer, these game-changing technologies that we believe define our global future all rely either directly or indirectly on an even more basic element: energy. Read more. As more and more wide bandgap semiconductors reach electric vehicle markets, industry can expect rapid power module package development, reports Compound Semiconductor. Read more. The R-REF01-HB reference design consists of a half-bridge suitable for voltages up to 1kV and a fully-isolated driver stage with isolated power supplies for the low-side and the high-side switching transistors. It is suitable for single-gate drive supply voltages as low as +4 V and dual-gate drive supply voltages as high as +20 V / -5 V (30 V max), with no maximum duty cycle limitations. Learn more. Research and development is currently under way involving small-scale, closed-cycle gas/air turbine engines that operate under elevated pressure. Advances in silicon-carbide chemistry has produced a variant that offers one of the highest recorded coefficients of thermal conductivity and maintains constant mechanical properties at temperatures up to 1400-degrees C. This material forms the basis of heat exchangers used closed-cycle turbine engines that offer competitive energy efficiency and lighter weight than conventional gas turbine engines… Read more. In this episode of the PSDcast, Jim Witham with GaN Systems talks about "range anxiety" and discusses the biggest issues affecting the wider rollout of electric and hybrid vehicles. Listen now. “We’re using the latest silicon carbide control chips in the inverter which enables us to switch frequencies very quickly, control temperatures very well and also have a great degree of reliability. So it’s a very efficient device.” Read more. The Battery Show (September 11-13) connects you with more than 8,000 engineers and executives, and more than 600 leading suppliers, across the advanced battery supply chain. A powerful, end-to-end showcase, this leading global industry event covers today's emerging advanced battery technology for the automotive, portable electronics, medical technology, military and telecommunications, and utility and renewable energy support sectors. Explore the full spectrum of cutting-edge solutions you need to make faster, smarter, and more cost-effective products at the most comprehensive industry event in North America. Register now. This research presents the modeling of a SiC power diode at extreme pulsed power densities and shows direct correlation between measured high-power characterization and simulated current and voltage waveforms. SiC PiN diodes are slated to replace current silicon (Si) diodes used in various pulsed-power applications. These high-power diodes are critical in various pulsed systems to protect both active and passive components from reverse voltages and currents. SiC’s electrical, thermal, and mechanical properties make it a more viable candidate than its Si counterpart for high-action pulsed-power applications. Download now. This paper demonstrates that SiC-based multilevel inverters are potent for solar power applications due to their ability to synthesize waveforms with better harmonic spectrum. Download now. In the News: The Feds Blocked Cree’s Efforts to Sell its Chip Business. Now it’s Their Future. Early last year, Cree’s chip-making Wolfspeed subsidiary was akin to the company’s redheaded stepchild. Wall Street commentators saw it as a high-cost, low-profit business and applauded the electronics manufacturer’s plan to unload it to a German competitor. Nowadays, Cree’s top executives see Wolfspeed not as a liability, but as the key to the company’s future. They’ve told investors they think it can grow from generating about $221 million a year in revenue to about $850 million a year, and do that by 2022. Read more. Engineers are always looking for an edge in their designs to extract as much power and performance as possible from a system, while attempting to meet industry trends in miniaturization. In the power electronics industry, this has required an examination of the materials being used to overcome inherent limitations from heat, voltage, or switching speed. Read more. Adil Salman from Wolfspeed recently shot a video with Power Electronic Tips covering a silicon carbide charging circuit demonstration. The charger used Wolfspeed SiC MOSFETs. It had two stages. One is a PFC (power factor correction) stage, the other is an LLC converter stage. Watch the video. When working with the design of solar inverters, meeting a certain efficiency specification was mandatory to be competitive in the market. This is a challenge, especially with 1200 V IGBTs, and required attention to every detail, from bus bar thickness to inductor core material. Read more. A silicon carbide inverter could halve the system cost of a photovoltaic facility and enable solar power to be consistently delivered to a growing number of homes and businesses through the power grid. Read more. The present paper proposes a different approach to implementation of modern traction converters in electric multiple units (EMUs) that involves the use of fast switching 1.2-kV SiC MOSFETS. The SiC-based PETT proposed in the paper is dedicated first for the DC traction. For multi-system application the input voltage of the proposed PETT can be adjusted using weight-optimized adjusting autotransformer. Thanks to utilization of fast-switching SiC-based power modules, the weight and size of the power electronic cells can be optimized in a convenient way. Download now. The silicon carbide power semiconductor market is driven by diodes for power factor correction and photovoltaic applications, but transistors are rising at a compound annual grown rate of 50% to be the main driver in 2023. Learn more. Microsemi's SP6LI extremely low inductance silicon carbide (SiC) MOSFET power modules feature phase leg topology ranking from 1200 volts (V), 210 amperes (A) to 586 A at a case temperature (Tc) of 80 degrees Celsius to 1700 V, 207 A at Tc of 80 degrees Celsius. Offering higher power density and a compact form factor, the new package enables lower quantity of modules in parallel to achieve complete systems, helping customers to further downsize their equipment. Learn more. This reference design provides an example of a highly isolated SiC MOSFET dual-gate driver for the SP6LI SiC phase leg modules. It can be configured by switches to drive in a half-bridge configuration with only one side on at any time and with dead time protection. It can also be configured to provide concurrent drive, if necessary. Learn more. New evaluation board demonstrates the efficient operation of Cree’s 1700 V, 1 Ohm SiC MOSFET with an availability of high blocking voltage and high creepage distance (~ 7mm). Application note available. Learn more. Wolfspeed has announced its E-Series™, a new family of robust SiC semiconductor devices for the Electric Vehicle (EV) and renewable energy markets that delivers the highest available power density and durability for on-board automotive power conversion systems, off-board charging, solar inverters and other outdoor applications. Read more. The SiC market is still being driven by diodes used in power factor correction (PFC) and photovoltaic (PV) applications. However, Yole expects that in five years the main SiC device market driver will be transistors, with a 50% CAGR over 2017-2023. Read more. Vincotech is the go-to source for SiC-based power modules that boost efficiency and enable more compact designs. No one has shipped more SiC-driven power modules than Vincotech, so the company knows when SiC components are best for the customer's application and when another option is the wiser choice. Read more. In this article a 250 kW all-SiC inverter evaluation kit designed around low-inductance, high-speed power modules is used to demonstrate the DC bus switching performance resulting from the interaction among commutation loop parasitics and the switching dynamics. Read more. The train will be around 15% lighter than the current Velaro, reducing the weight of a seven-car train by more than 70 tonnes. This has been achieved through the use of inside-frame bogies, silicon carbide auxiliary converters, and the use of friction-stir welding for bodyshell fabrication. Read more. "Silicon carbide is kind of a next-generation material for use in power electronics devices," Becca Jones-Albertus, deputy director of the Solar Energy Technologies Office with the U.S. Department of Energy, said. It could replace silicon-based power inverter technology and reduce power losses, she said. Read more. The new package, developed specifically for the company's SP6LI product family, is designed to offer 2.9 nanohenry (nH) stray inductance suitable for SiC MOSFET technology and enable high current, high switching frequency as well as high efficiency. Read more. Microsemi Corporation announced it will be expanding its Silicon Carbide (SiC) MOSFET and SiC diode product portfolios early next quarter, including samples of its next-generation 1200V, 25mOhm and 80mOhm SiC MOSFET devices; next-generation 700V, 50A Schottky barrier diode (SBD) and corresponding die. Read more. Microsemi Corporation has announced the availability of its new scalable 30kW, three-phase Vienna power factor correction (PFC) topology reference design developed in collaboration with North Carolina State University and featuring Microsemi’s silicon carbide (SiC) diodes and MOSFETS. Read more. In this episode of the PSDcast, Microsemi’s Avi Kashyap chats about SiC MOSFETs and their use in automotive and industrial applications. Listen now. Power electronics systems based on silicon carbide (SiC) and gallium nitride (GaN) semiconductors are becoming mainstream. Supporting the transition to these long-anticipated technologies is PowerAmerica, a consortium of nearly 50 industry and university members focused on accelerating the adoption of SiC and GaN technology in a wide range of power electronics systems. Based at North Carolina State University, members range from startups to multinational corporations, as well as top research universities across the U.S. Read more. Generating power from the sun isn’t the problem. The technology has been there for decades. Storing that power efficiently, however, has been a challenge. Until now. Read more. Gallium nitride, better known as GaN, is a power technology that seems forever locked in a battle with Silicon carbide, aka SiC. Is that battle a real one, or is it more a fabrication? Watch now. As power conversion applications rapidly transition to GaN and SiC technologies, Richardson RFPD can assist you in your integration plans with our broad selection of GaN and SiC resources to help speed your time-to-market. Visit us at PCIM 2018 and enter for a chance to win a GaN, SiC or gate driver evaluation product. Click here to learn more and submit your entry in advance of the show. Energized by demand from power supplies, photovoltaic (PV) inverters and adoption in the main powertrain inverter in hybrid and electric vehicles (HEV/EV), the market for silicon carbide (SiC) and gallium nitride (GaN) power semiconductors will rise at a compound annual growth rate (CAGR) of over 35% from 2017 to nearly $1bn in 2020 then $10bn in 2027, forecasts the 'SiC & GaN Power Semiconductors Report - 2018' from IHS Markit. Read more. Wide-bandgap SiC and GaN devices, from IGBTs to power modules, will play increasingly important roles—especially in terms of cost—in electric-vehicle design. Read more. For fiscal third-quarter 2018 (ended 25 March), Cree Inc of Durham, NC, USA has reported revenue of $356m, down 3% on $367.8m last quarter but up 4% on $341.5m a year ago. However, this includes just under a month’s activities from the Infineon RF Power business (acquired on 6 March). Excluding this, revenue was $352m, up 3% year-on-year, and towards the upper end of the expected range of $335-355m… Read more. This paper proposes a gate driver topology that improves the switching performance of SiC-MOSFETs, and confirms the reduction in switching loss and delay time through experimental results. Download now. GaN and Silicon Carbide suppliers are innovating from the pins in, providing incredible technologies, that inch us closer to the ideal switch. Frequencies and performance can be increased to unheard-of levels. The parasitic capacitances inherent in all semiconductor switches are drastically lowered, making devices easier to drive. Early manufacturing issues have largely been solved – reliability promises to meet, if not exceed, that of silicon semiconductor devices, and every day semiconductor devices are made better and better, including competing silicon devices… Read more. This article offers an examination of the packaging trends and opportunities for power discrete and modules for the most demanding power switching applications. Read more. This paper describes the design, fabrication and characterization of a high-density, 10 kV, 60 A, wire-bond-less, planar SiC half-bridge module. Key design considerations include: the mitigation of high electric fields in the substrates, interconnects and lead-out connections; suppression of switching voltage overshoot and common-mode interference; high-performance thermal management. Read more. As power conversion applications rapidly transition to GaN and SiC technologies, Richardson RFPD can assist you in your integration plans with our broad selection of GaN and SiC resources to help speed your time-to-market. Visit us at PCIM 2018 and enter for a chance to win a GaN, SiC or gate driver evaluation product. Click here to learn more and submit your entry in advance of the show..
Energy efficiency has become a key global focus because of its contribution toward reduced carbon-dioxide emissions. One significant area of contribution is the electrification of vehicular technology. Read more. Silicon carbide and gallium nitride are making their way into solar inverters, electric-vehicle chargers and — possibly — EV drivetrains. Read more. If you read nothing else, these words can sum-up the power electronics industry as it stands today: SiC, GaN and magnetics, with a focus on electric vehicles, digital servers, renewable energy and wireless… Read more. Trials on Stockholm’s Green Line with a C20 metro car equipped with Bombardier’s new silicon carbide (SiC)-equipped Mitrac TC1500 traction converter have shown energy reductions of up to 35%, and a 19 dB reduction in noise emissions… Read more. Microsemi has announced sampling availability of the first product in its next-generation 1200-volt (V) Silicon Carbide (SiC) MOSFETs, the 40 mOhm MSC040SMA120B. The company also announced the release of its complementary 1200 V SiC Schottky barrier diodes (SBDs), further expanding Microsemi's growing SiC discretes and modules portfolios. Read more. This 6.6kW bi-directional on-board charger (OBC) design targets high-efficiency, high-power-density onboard charger applications. The high voltage rating of Wolfspeed SiC MOSFETs allows the dc bus voltage to vary according to the battery voltage to achieve optimal efficiency. Read more. ARPA-E awards $30 million to advance a new class of high-performance power converters employing Wide Bandgap (WBG) semiconductors like GaN and SiC. Read more. Infineon Technologies AG (IFX.XE) said Monday that it has reached a long-term agreement with Cree Inc. for the supply of silicon-carbide, or SiC, wafers. Read more. Article: Thirty Years of Driving Innovation – Why Silicon Carbide? Cengiz Balkas, SVP & General Manager at Wolfspeed, looks back to 1987, when the founders of Cree invested considerable time and effort in a material that they knew could create a more powerful world: silicon carbide (SiC). Scientists saw SiC’s potential to enable more efficient, reliable alternatives to silicon devices at high voltages, and Cree was the first to see and realize its commercial viability for use in power and RF semiconductors… Read more. This article demonstrates a design concept using commercially available SiC MOSFETs (C3M0065100K), which meets new market requirements for bidirectional functionality. A prototype 20-kW system in a simple two-level topology — switching at 48 kHz is shown. The prototype is tested to full power where measured results suggest a potential approximately 0.5-1.0 percent efficiency improvement over Si IGBT systems. Read more. Silicon carbide (SiC) MOSFETs are making major inroads into solar inverters. Engineers are keen to achieve high efficiency across the entire load range. SiC MOSFETs' low on-state resistance and low switching losses support those efforts, especially when the focus is on achieving high efficiency at light loads. The intrinsic body diode is a very rugged component that enables engineers to install SiC MOSFETs in hard-switched, totem-pole configurations that use synchronous rectification to achieve highest efficiency. But latest-generation SiC MOSFETs have their limitations. This webinar zooms in for a closer look at these drawbacks and puts forward solutions to resolve the issues at hand. View now. Mitsubishi Electric Corporation has announced that it has developed a 6.5kV full silicon carbide (SiC) power semiconductor module that is believed to offer the world’s highest power density (calculated from rated voltage and current) among power semiconductor modules rated from 1.7kV to 6.5kV. Read more. SiC MOSFETs and diodes are gaining market share in the power electronics industry. Many designs already utilize discrete SiC devices. However, the transition from discrete devices to higher power modules is not always easy. This presentation focuses on the proper utilization of SiC devices in power modules and higher power applications. Watch now. Wide-bandgap materials have been around for decades, used in RF applications as well as for LEDs and some power and switching applications. Today, however, alternative energy applications have become a huge driver in pushing the broad adoption of wide-bandgap materials. Read more. Leverage Richardson RFPD’s stock for a selection of 900 V, 1000 V, 1200 V and 1700 V product. Act fast as availability is subject to prior sale. Learn more. Available now from Richardson RFPD, a new Microsemi white paper entitled "4H-SiC 1200 V Junction Barrier Schottky Diodes with High Avalanche Ruggedness." Request your free copy. Join Richardson RFPD at APEC 2018, March 4-8 in San Antonio, TX. Visit us at stand 1147 and learn how Richardson RFPD can help you speed your time-to-market for GaN and SiC designs. CEO Gregg Lowe says Cree could be a month away from announcing its new “strategic direction…” Read more. Silicon carbide technology is at the core of the company’s plan. That technology allows it to advance a trend popularized in just about every corner of the technological marketplace: greater efficiency paired with smaller size. Thus far, many of their experiments with the technology have focused on the lower voltage side of the market, but the company is beginning to push its potential to make the whole grid more resilient. Strengthening the grid’s resiliency, particularly after natural disasters that lead to service disruptions, is critical… Read more. To solve the simulation convergence problem of Silicon Carbide metal-oxide semiconductor field effect transistor (SiC MOSFET) models, this paper proposes a non-segmented model for SiC MOSFETs, which uses non-segmented, smooth continuous equations to describe the static and dynamic characteristics of SiC MOSFET. Further, the static characteristic of SiC MOSFET obtained by the non-segmented model is verified by comparing the simulation curves with the static curves provided in datasheet, and the dynamic characteristic is verified by comparing the simulation rise time and fall time of voltage with the datasheet based on the double pulse simulation circuit... Download the pdf. The foundation of any electrical system is the ability to efficiently condition and supply power. The work presented in this thesis explores integrated SiC power management solutions in the form of linear regulators and switched capacitor converters. While switched-mode converters provide high efficiency, the requirement of an inductor hinders the development of a compact, integrated solution that can endure harsh operating environments. Read more. This study applies Full-SiC H bridge circuit topology in Switched Reluctance motor (SR motor) drive and synchronous rectification to reduce conduction loss. In addition, it proposes switching sequence to balance heat generation in drive circuit for integrated SR motor drive system. The loss of inverter is experimentally evaluated and confirmed the effect of proposed heat balancing. Read more. The Power Electronic Industry has achieved a new milestone with the creation of JEDEC’s newest main committee, the JC-70 Wide Bandgap Power Electronic Conversion Semiconductors. Read more. Power – creating more efficient uses is one of the most pressing challenges in the 21st century. We live in an increasingly data and energy driven world that is following a clear trajectory of increasing reliance on and proliferation of data centers, electric vehicles, renewable energy, powerful industrial motors, and smart consumer electronics. The dramatic increase in computing, electronics, and global population demands attention to our growing power and efficiency needs… Read more. A research group in Japan announced that it has quantified for the first time the impacts of three electron-scattering mechanisms for determining the resistance of silicon carbide (SiC) power semiconductor devices in power semiconductor modules… Read more. Learn how the SiC diode enables efficient power conversion and smaller and lower system costs in automotive, power supply, semicap and welding/heating equipment, medical, and aviation applications. Watch on-demand now. The Power Electronics Industry Collaborative (PEIC) organised a special session on workforce challenges and opportunities facing the power electronics industry at the IEEE Energy Conversion Congress & Expo (ECCE), held Oct. 1 – 5, 2017 in Cincinnati, OH. Six expert panelists from PEIC member companies and affiliates shared their collective vision for enhanced workforce development initiatives in power electronics. Read more. Recently, Yole Développement released three reports related to the SiC wafer industry—RF Power Market and Technologies 2017: GaN, GaAs and LDMOS; Power SiC 2017: Materials, Devices, Modules and Applications; and Status of the Power Electronics Industry 2017. Read more. This Engineering360 webinar from Wolfspeed presents an optimized two-level, three-phase 20 kW hardware prototype PFC design using 1 kV SiC MOSFETs. The performance of this SiC-based AC/DC converter is then compared against similarly rated AC/DC converter topologies with primary emphasis on the Vienna rectifier using SJ MOSFETs. Watch on-demand now. "…Wide band-gap switching materials like silicon carbide and gallium nitride (could) provide cost-competitive alternatives in lower-voltage, high-performance applications over the next several years. Beyond that, however, 'there are few technology developments in the pipeline that will result in step-function price declines in the medium term…" Read more. X-FAB Texas is expanding its production of silicon carbide power devices, making it the world’s first 6-inch silicon carbide foundry, said CEO and President of X-FAB Texas Lloyd Whetzel. The upgrade will create 50 new jobs and a total value-added impact of $7.5 million, according to a news release from LEDA… Read more. Standard electronics used commercially and for planetary exploration are based on silicon semiconductors, which do not operate at Venus temperatures. A team at NASA Glenn Research Center (GRC) has been working to develop high temperature electronics based on silicon carbide (SiC) semiconductors that can operate at Venus temperatures and above. Recently, the team demonstrated that a variety of the world's first moderately complex SiC-based microcircuits (tens or more of transistors) could withstand up to 4000 hours of operation at 500° C. Read more. "Applications of SiC MOSFETs in AC-DC Converters Dedicated for Distributed Generation Systems" opening chapter includes an illustration of the particular features provided by the wide band gap devices, design parameters of the analyzed demonstrators where different types of SiC MOSFETs are considered, and the presentation of experimentally measured efficiency characteristics and current-voltage waveforms. Read more. This paper’s analysis of failure data shows that the short warranties and reliability concerns associated with solar PV inverters reduce the long-term ROI of residential solar PV systems by up to 10%. Methods to improve the reliability of PV inverters, such as selection of capacitors, inverter topology, and incorporating wide-bandgap semiconductor devices, are presented. Electric racing has introduced a whole new way of thinking about powertrains to many fans. While the battery and the motor may be relatively easy concepts to understand, what on earth is an inverter – and, more importantly, how can it deliver a competitive advantage? Current E sat down with Angus Lyon, head of powertrain at Mahindra Racing, to provide some clarity. Read more. Application Note: Wolfspeed's "Analog Based 2.2 KW High Efficiency CCM Bridgeless Totem Pole PFC"
Download this application note which discusses the use of the latest SiC MOSFETs in new, low-inductance packaging to design a PFC system. When combined with a DC/DC circuit, the system can achieve system-level efficiency suitable for the 80+ titanium standard. Designers of server and telecom power supplies will especially appreciate reaching 80+ titanium efficiency requirements with no additional cost or complexity. Download now. When Jayant Baliga invented the insulated gate bipolar transistor in the 1970s—something for which he won the 2014 IEEE Medal of Honor—it went from prototype to commercial product in about a year and a half. His quest to make silicon carbide a key material for power electronics has taken decades longer… Read more. This article shows designers the improved performance versus cost tradeoff space enabled by 1,000 V SiC MOSFETs and a simple two-level, six-switch three-phase PFC topology. These devices promise to breathe new life into this well-understood simple topology and, with appropriate control systems, mitigate the conventional barriers to achieving high performance at increased switching frequencies with full bidirectional functionality. Read more. Gallium nitride, a III/V semiconductor eyed for its performance in high-voltage electronics, is gaining traction for markets pertaining to electric vehicles, continuous sensing and communication for autonomous cars, and military applications. Read more. Three market / technology forces are moving in concert to create an opportunity for SiC MOSFETs to be an enabling technology in the Battery powered Electric Vehicle (BEV). The pull of the developing traction-drive requirements for BEV drive-train, which can utilize SiC to cut inverter losses by ~78 % in the EPA drivecycle, can offer BEV designers increased range or reduced battery costs for the same range. Download now. Researchers from North Carolina State University are rolling out a new manufacturing process and chip design for silicon carbide (SiC) power devices, which can be used to more efficiently regulate power in technologies that use electronics. The process - called PRESiCE - was developed with support from the PowerAmerica Institute funded by the Department of Energy to make it easier for companies to enter the SiC marketplace and develop new products. Read more. This paper includes an overview of the properties of AlGaN that motivate its application to power switching, as well as an analysis of conduction and switching loss mechanisms as a function of AlGaN bandgap for various device types (PiN diodes, Schottky diodes, etc.) These results are then compared to similar metrics for SiC, GaN, and UWBG materials other than AlGaN. Read more. The RxxPxxyyD Series devices feature 6400 VDC isolation and <10 pF isolation capacitance and have been designed to fulfill the demanding requirements of high slew-rate SiC transistor drivers. Learn more. Creating accurate models for Wide Band Gap (WBG) power devices representing their complete behavior is vital to the system simulation for ensuring that the simulation results are highly accurate. Read more. Advances in wide bandgap (WBG) power devices are enabling silicon-carbide (SiC) and gallium-nitride (GaN) devices that can operate at higher voltages and temperatures than conventional semiconductor devices. Also, they can switch at faster speeds with lower switching losses. New SiC and GaN solutions and developments are especially taking hold in three fields: data centers, wireless charging, and energy harvesting. Read more. “…We’ve squeezed every drop of juice out of silicon in the industry,” says John Shen, one of the ARPA-E grant winners and a professor of electrical and computer engineering at the Illinois Institute of Technology on Chicago’s South Side. “So to move forward, to get a higher conversion efficiency, we’re looking into what we call wide bandgap semiconductor materials, the future generation of power semiconductor devices.” Read more. With funding assistance from PowerAmerica, SiC device and power module company Wolfspeed has developed first-of-its-kind silicon carbide power modules for 3.3 kV and 10 kV applications. According to the company, this is the first SiC power module at these voltage levels to use exclusively the MOSFET built-in body diode as the anti-parallel rectifier. Read more. SiC MOSFETs are coming into prominence in select power switching applications above ½ kV, especially in those that benefit from the high-speed capability of SiC MOSFETs. This application note focuses on optimization for speed to minimize switching losses and to get the full benefit of the devices. Download now. Transforming the device level advances of SiC technology (lower on-state losses, lower parasitic capacitances and potentially higher switching frequencies) into smaller and more efficient converters present numerous challenges. One of the challenges is understanding and optimizing the more rapid switching waveforms, including predicting and managing parasitic oscillations, switching losses and electromagnetic interference (EMI)… Read more. SiC MOSFETs and diodes are gaining market share in the power electronics industry. Many designs already utilize discrete SiC devices. However, the transition from discrete devices to higher power modules is not always easy. This Wolfspeed presentation, presented by IEEE GlobalSpec, focuses on the proper utilization of SiC devices in power modules and higher power applications. Learn more and register now. The University of Arkansas and Cree Fayetteville will receive more than $4 million from the U.S. Department of Energy’s Advanced Research Projects Agency-Energy (ARPA-E) to develop more efficient electric power converters. Read more. Variations in manufacturing expertise, yields, and access to existing facilities currently have a greater impact on regional costs and manufacturing location decisions for SiC ingots, wafers, chips, and power modules than core country factors such as labor and electricity costs. Read more. This RECOM white paper goes beyond the usual transistor specification considerations and looks at the driver circuit as a significant contributor to the robustness of the final design. Learn more. CEO Chuck Swoboda told analysts increased demand from the electric vehicle and battery storage sectors “is quickly bringing silicon carbide to the mainstream” and putting major pressure on the business. Read more. Company to develop state-of-the-art 1.7 kV and 3.3 kV SiC MOSFETS and diodes as part of PowerAmerica Institute's $70 million backing from the U.S. Department of Energy over five years. Read more. This paper reviews the characteristics of 15 kV SiC MOSFET and offers a comprehensive guideline of implementing this device in practical MV power conversion scenarios such as AC-DC, DC-DC and AC-AC in terms of topology selection, loss optimization and thermal management. Read more. Three market / technology forces are moving in concert to create an opportunity for SiC MOSFETs to be an enabling technology in the Battery powered Electric Vehicle (BEV). The pull of the developing traction-drive requirements for BEV drive-train, which can utilize SiC to cut inverter losses by ~78 % in the EPA drivecycle, can offer BEV designers increased range or reduced battery costs for the same range. Read more. SiC MOSFETs are coming into prominence in select power switching applications above ½ kV, especially in those that benefit from the high-speed capability of SiC MOSFETs. This Microsemi application note focuses on optimization for speed to minimize switching losses and to get the full benefit of the devices. Read more. Kettering recently concluded its research with PowerAmerica, a public-private partnership between industry, the U.S. Department of Energy and academia, including 11 university partners. The goal of Power America is to accelerate the adoption of advanced semiconductor products made with Silicon Carbide (SiC) and Gallium Nitride (GaN) into a wide range of products. Read more. Wolfspeed recently developed a comprehensive reference design that demonstrates the implementation of a totem-pole PFC topology in a 2kW bridgeless power supply. 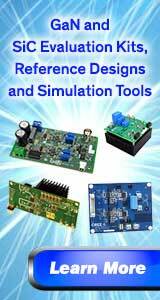 At 230V redundant operation the reference design can easily exceed the 80+ Titanium standards. The design achieved actual results of 98.7% peak efficiency at half load and 98.55% efficiency at full load. Read more. Automotive, industrial, and other applications that require smaller size, lighter weight, and more efficient operation are increasingly looking to SiC and GaN solutions. Read more. Analog Devices Inc. has launched the ADuM4120 and ADuM4121 series of small form factor isolated gate drivers that are designed for power switch technologies, such as silicon carbide (SiC) and gallium nitride (GaN), which require higher switching speeds and system size constraints. Read more. The new C3M0075120J is the surface-mount version of Wolfspeed’s 1200 V, 75 mOhm MOSFET C3M0075120K. Like the 4L-TO247, the surface-mount device includes a Kelvin-source pin to help minimize gate-ringing and reduce system losses. Learn more. Reports include a prediction that the SiC market will grow steadily at a CAGR of over 14 percent between 2017 and 2021, driven by the growing demand for power inverters for electric vehicles. Read more. Through PowerAmerica, John Deere has formed a collaboration with researchers from the Department of Energy National Renewable Energy Laboratory to develop a 200 kW 1050 VDC silicon carbide-based inverter. The inverter will convert vehicle engine power into electrical power needed for hybrid motors in heavy duty construction vehicles. Read more. The APT30SM120JCU2 (boost) and APT30SM120JCU3 (buck) are built with SiC MOSFETs and SiC Schottky diodes, and therefore combine the advantages of both, including low RDS(on), high-temperature performance, zero reverse recovery, zero forward recovery, temperature-independent switching behavior, and positive temperature coefficient on VF.